I tried the last of the top Shanghainese restaurants in Chinatown on Sunday. The top, in no particular order, being Joe's Shanghai, Shanghai Kitchen, Shanghai Cafe, and Green Bo. I met up Frank, who I hadn't seen in about five years, and his friends at Shanghai Cafe. This was the last leg of their NY food tour which consisted of a schedule I've only dreamed of, six restaurants a day including two dinners! I've secretly wanted to do something similar but was too embarrassed to see if anyone would be down but now you know. Hit me up if you're ever down! For real, for real. Now, on to the food. Shanghai Cafe and Joe's Shanghai's xiao long bao (soup dumplings) come to a bit of a tie. I say this because it depends on what you like. Neither of them hit all three criteria, thin "skin" (wrapper), plentiful and flavorful soup, and tender meat. Joe's Shanghai has the thin wrapper and soup down. Shanghai Cafe has plentiful soup and better meat texture, though I may like the flavor of the soup at Joe's better. I'll have to try it again. As far as the other food goes, I think Shanghai Kitchen has Shanghai Cafe and definitely Joe's Shanghai beat. Joe's Shanghai is extremely greasy. It's been so long since I've been to Green Bo so I can't comment on that. None of them though beat my all time favorite Fountain Court in SF which is unfortunately closed. How I miss that place. 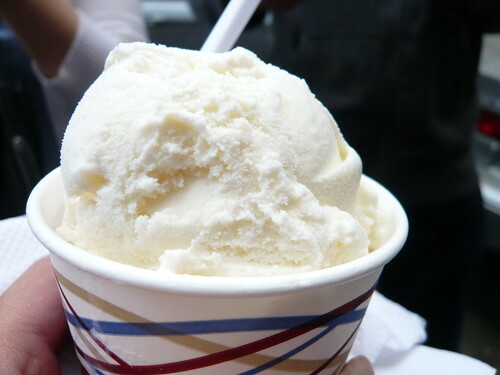 After Shanghai Cafe we went to the Chinatown Ice Cream Factory for some unique flavors, including durian a.k.a stinky fruit haha. They were out of the egg custard flavor and the mango papaya so I opted for the lychee and others had the black sesame which tasted spot on. 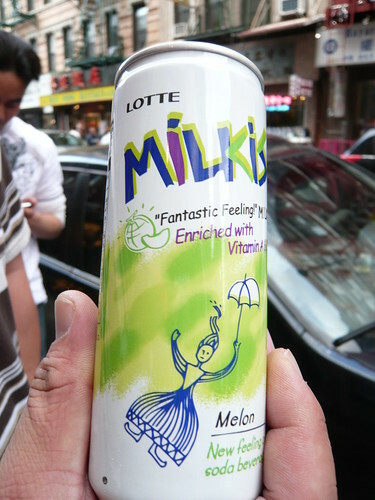 Frank's friend also had Milkis (Korean carbonated milk drink) so we tried it. Not sure about the "Fantiastic Feeling" but if anyone cared for a drink version of Hi-Chews (Japanese fruit gummy), there you have it. we gotta go dumpling hopping next time haha!